At a small company in Rockville, Maryland, a handful of researchers are working on viruses that can be tailored to avoid destruction by the body’s immune system. These engineered viruses are intended to infect and directly destroy cancer cells, mobilize the immune system to hunt down and destroy solid tumor cells throughout the body, and enhance the effectiveness of other immunotherapies. BeneVir’s T-StealthTM technology has been designed to allow the virus to hide from the immune system. This enables the virus to spread further and persist longer in tumors, which may improve induction of an anti-tumor immune response. That’s what attracted Janssen to BeneVir Biopharm, Inc., which it then acquired in May 2018. 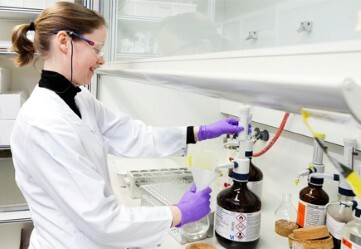 BeneVir’s unique technology and innovative research team deepens Janssen’s immuno-oncology expertise, as well as strengthens and differentiates the cancer immunotherapy strategy and portfolio. Founded by husband-and-wife team Matthew (Matt) Mulvey (Chief Executive Officer) and Katherine (Katie) Sacksteder (Chief Operating Officer), BeneVir represents Janssen’s resolve to seek out the best science to develop transformational therapies for patients with cancer. It is a resolve shared by both Katie and Matt, and their team at BeneVir. The desire to translate therapies to humans fueled Matt’s decision to move from academic research to the biotech industry, where he met Katie, who hired him into a research job. Then in 2009, a small biotech company, published data on its oncolytic virus. “It was the first virus that seemed to work in cancer,” Matt said. In 2015, it became the first oncolytic virus to be approved by the U.S. Food and Drug Administration. It was a wake-up call for Matt and Katie, who had envisioned forming a company. The husband-and-wife team founded BeneVir that year, convinced that they could create more effective oncolytic viruses and find the funding for their work. The BeneVir team subsequently developed the T-Stealth™ Oncolytic Virus Platform. Through this unique technology, the BeneVir team is working to tailor viruses to specific tumor microenvironments – environments that allow tumors to grow by inhibiting the immune system’s ability to recognize and eliminate them. While T-StealthTM oncolytic viruses infect both normal cells and cancer cells, they only replicate in cancer cells. Once enough new viruses are made inside the cancer cell, the cell ruptures and dies and releases the viruses so they infect and kill nearby cancer cells. This is one mechanism by which oncolytic viruses kill cancer cells. “What we hope to do is identify the major immunosuppressive tumor microenvironments for the most patients, and design viruses to reverse those mechanisms and mobilize other immunotherapies to help the immune system infiltrate tumors and do its job more effectively,” Matt said. What Matt and Katie want most is to see the potential of their technology made available to as many patients as possible. To do that, they needed a partner with a pipeline that the BeneVir technology could enhance, because the emerging consensus is that oncolytic viruses may be best used in combination with other immunotherapies. They met with several companies, but in the end, they put their trust in Janssen. “When we met with Janssen, they were engaged, they had done their homework, and they came to the table with ideas,” Katie added. The acquisition strengthens Janssen’s capabilities with an oncolytic virus platform that may tailor therapies to specific tumor microenvironments in the future. In return, Janssen provides BeneVir with a wealth of experience in regulatory affairs, clinical development and manufacturing, as well as a robust pipeline of potential immunotherapies to pair with the viruses. Janssen and BeneVir share the vision that the next wave of anti-cancer drugs should be multi-modal regimens, evidence-based, rational-designed, and tailored to patients’ needs. “Our collaboration is based on one important goal -- to make new, innovative oncology treatments effective for more patients,” Matt said.